Although class teaching, together with mentoring of the students, is the most important aspect of the teachers’ work, they are also representatives of Slovenia, who provide their students with information about Slovene culture and topical events in Slovenia. At most lectureships there are every year various cultural events for which teachers often obtain sponsorship from Slovene companies abroad and funds from public calls for applications, while the STU also covers some of the costs: film evenings featuring films from the Slovenian Film Centre, literary evenings and translation workshops, visits by Slovene writers, musicians etc., and lecturers from Slovene universities, other events with financial support from the Slovenian Book Agency (JAK) and some publishing houses, especially Študentska založba. Alongside these events, teachers together with their students often prepare printed materials, and the Slovene embassies also make their contribution. Every year, students from some lectureships have the opportunity to go on excursions to Slovenia. Since 2004, a number of projects for the promotion of culture have taken place every year or every two years at all the foreign universities where Slovene is taught. There have so far been five of these, the last four under the shared title of World Festival. The purpose of the projects is to promote links between Slovene Studies departments around the world and cooperation among teachers of Slovene at foreign universities, and with Slovenia. The projects aim to present as widely as possible Slovene language, literature and culture, and to promote Slovene at foreign universities where the language is taught and more widely where there are Slovene communities. Project guidelines are always decided at meetings of teachers, who are often the project initiators. The projects are coordinated by the STU programme at the Centre for Slovene, where various experts prepare common publications and promotional materials, provide films, and so on. In Slovene Studies departments, teachers and students prepare events for the central week of the project, which is always in late November or early December in the year of the project. During this week, at universities across the world, many such events unfold. Project preparations last throughout the year, with teachers and students translating literature, subtitling films, agreeing guest visits from Slovenia, and organising workshops and literary evenings. Financial support for the projects is partly ensured by the Ministry for Education, Science and Sport, while further resources are obtained tkrough the participation of different institutions. Slovene embassies around the world prepare receptions and help organise events to which they invite Slovenes living abroad, emigrants and Slovenes in border areas of neighbouring countries. The Slovene national television and radio stations are also actively involved. The project will take place from 3 to 9 December 2018 at more than 50 universities around the world where Slovene is taught. The central part of the events will be the introduction of Antologija literature Ivana Cankarja s prevodi v tuje jezike (Anthology of Ivan Cankar’s Literature with Translations into Foreign Languages) that was just published, with the translations carried out by the teachers of Slovene and their students, and established translators into 21 languages. In the project participated 42 universities around the world, 45 teachers of Slovene, 218 translators and 42 language consultats. The Anthology was edited and printed by the Centre. Also the vents will be dedicated to two new documentaries about Ivana Cankar Tisoč ur bridkosti za eno uro veselja (2018, director Dušan Moravec, scenario Matjaž Pikalo), and Cankar (2018, director and scenario Amir Muratović). The project was carried out from 1 to 5 December 2014 at more than 50 universities around the world where Slovene is taught. The central part of the events was the introduction of the bilingual booklets Žepna slovenščina (Pocket Slovene) that were translated by the Slovene teachers and their students, and established translators into 22 foreign languages. In the project participated more than 45 teachers, 220 translators and 43 language consultats. Booklets were edited and printed by the Centre. Booklets Žepna slovenščina (130 pages) are printed in the following languages: English, Argentinian Spanish, Bulgarian, Czech, French, Croatian, Italian, Japanese, Chinese, Lithuanian, Hungarian, Macedonian, German, Dutch, Polish, Portuguese, Romanian, Russian, Slovak, Serbian, Spanish, Ukrainian. The booklets are aimed to help visitors with their first contact with Slovene, Slovenia and Slovene Culture. This project included the publishing of the Anthology of Contemporary Slovene Literature, which incorporates samples of the work of 66 contemporary Slovene writers from the period 1980 to 2010. At Slovene Studies departments worldwide texts were translated into foreign languages from the Anthology, and guest visits, literary evenings and workshops were organised in the week from 29th November to 3rd December 2010. Through this project, contemporary Slovene writing was presented to foreign publics to encourage them to read and translate. These activities will continue in the coming years. 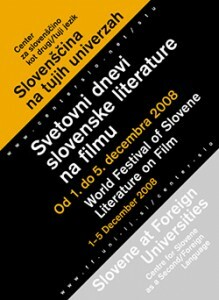 From 1 to 5 December 2008, there were showings around the world of Slovene films based on Slovene literary works. The project introduced to the widest possible public quality Slovene authors and successful film productions based on literary works. In this way we marked both the Slovene six-month presidency of the EU, as well as the European Year of Intercultural Dialogue. The following films were shown, contributed by the Slovenian Film Centre: Cockerel’s Breakfast (from the novel of the same name by Feri Lainšček; 2007), Sweet Dreams (scenario by Miha Mazzini; 2001) and Ringing in the Head (from the novel of the same name by Drago Jančar; 2002), plus the short films Vertigo Bird and A Child in Time. The Radio-Television Slovenia organisation also contributed to the lectureships in 2008 a documentary film about Primož Trubar entitled The Way, with the showing of which we marked the 500th anniversary of his birth. 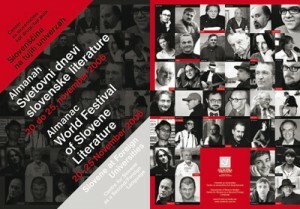 From 20 to 25 November 2006, an important cultural and promotional project, World Festival of Slovene Literature, was carried out within the framework of the STU programme at foreign universities: 38 leading Slovene authors made guest appearances at 53 foreign universities where Slovene lectureships or courses are based. Teachers of Slovene at foreign universities worked with the authors to prepare the visits (both their content and organisation) and cultural events, and they also translated works of literature with their students. The festival reached a wide audience: in addition to students and teachers at foreign universities, representatives of the Slovene community and Slovene organisations abroad, representatives of foreign publishing houses and the media. More than 3,000 people attended the festival. The Almanac World Festival of Slovene Literature was published in Slovene and English, presenting contemporary Slovene literary activities and 38 representative authors. In 2005 we celebrated the 100th anniversary of the Slovene film with the teachers of Slovene at foreign universities and Slovene diplomatic missions, within the framework of the International Promotion of Slovene Films project in collaboration with the Slovenian Film Centre. With screenings of four Slovene films (Dancing in the Rain, Cheese and Jam, Rustling Landscapes, Out of the East) and the publication of an information brochure, Slovene film and culture were presented to wider audiences at a number of universities. The project was carried out in the week from 21 to 24 November 2005 at 53 universities. Over 5,000 people viewed the films (20–200 per film) and the project received a great response in both the Slovene and foreign media; this was the biggest promotional project of Slovene culture ever undertaken. 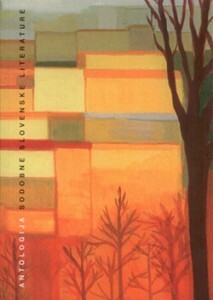 In 2004, STU organised at lectureships the project Translation of Slovene Literary Texts. A collection bearing the same title, including translations into 18 languages, was published on the occasion of a meeting of teachers in December 2004. The scope of the project is best shown by the collection, featuring excerpts from selected award winning modern authors – Erika Vouk, Iztok Osojnik, Tomaž Letnar, Mare Cestnik, Maja Gal Štromar, Dragica Potočnjak and Vinko Ošlak. As many as 32 Slovene teachers abroad participated in the project; the texts were translated by 103 students, and the translations were edited by 33 experts, mostly from language departments at the Faculty of Arts of the University of Ljubljana. The positive result of the project was not just the publication of the collection of translations and the promotion of Slovene literature, but also links that were formed between teachers and numerous students of Slovene, while it was also a good indicator of the interest in Slovene language, literature and culture among students of Slovene abroad.